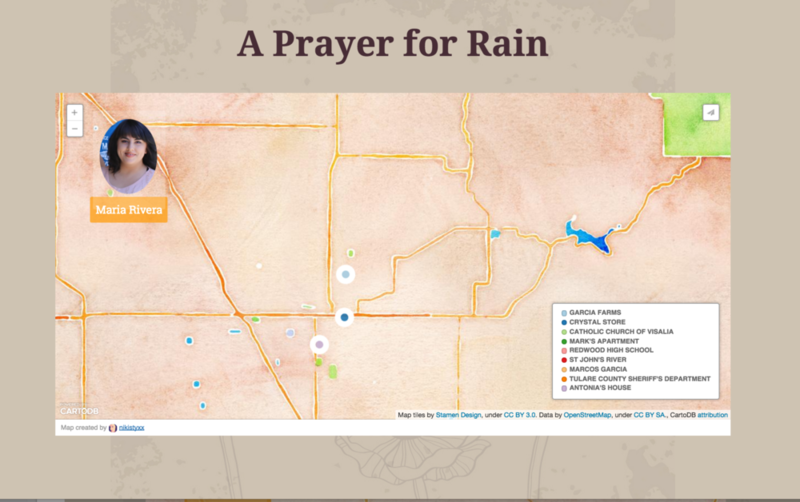 A Prayer for Rain is an transmedia adaptation of the Russian Rusalka myth which leverages interactive objects and maps to explore the water crisis in Central California. The project is meant to inform the user about the damages of climate change and unregulated groundwater consumption within California, through the story of the disappearance of a water witch in Visalia, CA. The piece will explore web based interactive media as well as three constructed, responsive objects as a means of storytelling. The water table has nearly collapsed, as the drought and over dependence on deep wells has caused the average elevation of the valley to sink ten feet since 1935. This process of unregulated water consumption in the state is contributing to the salienation of the remaining groundwater, making much of it non-potable. “The worst of the drought is tormenting the Tulare County community 160 miles north of downtown Los Angeles. In East Porterville, drinking water comes from private wells, not public utilities. Of the community's 7,300 residents, nearly 1,000 are without running water, county officials said.” (CNN 2014) If this trend spreads more and more locals could be without running water in their homes and the rest of the country could face reduction in available fresh food supplies. “With California in the grips of drought, farmers throughout the state are using a mysterious and some say foolhardy tool for locating underground water: dowsers, or water witches.” (Huffington Post 2014) Dowsing is an age old diving practice using copper rods, pendulums, or wooden sticks to find underground water flows. As the water table is sucked dry farmers are turning more and more to water witches to find well water locations. My exploration of water witches led me to the Russian mythology of the Rusalka. The Rusalka is a water spirit who lives in rivers and lakes who brings water to the farmers and their crops, but is also dangerous and sometimes deadly. This myth provides a fertile metaphor for the dangers of over-consuming water resources that on one hand are positive and allow us to grow food, but once crossed, can be disastrous. I want to use this myth as a platform to inform my inquiry and method of expressing these water usage issues. I have been researching environmental change along with speculative fiction to discover a way to create interest and visibility to the issue of water usage and climate change within California. This look into a rapidly changing climate on the planet led me to study Dystopian Futures which explore climate change. One influence on my thinking is JG Ballard’s novel, The Drowned World. The Drowned World explores earth after a series of solar flares have increased the intensity of the sun’s heat and radiation, where most of the previously habitable areas flooded, tropical jungle or swamps. The story follows the biologist Dr Robert Kerans and his struggles against the devolutionary impulses of the environment. The changing climate gives all the characters strange dreams, which haunt their waking life. I’m inspired by this projection of the future as people become more in tune and connected to the landscape around them. As nature changes the climate in dramatic ways we may be forced to examine our own connectivity and place within the larger ecosystem. The power of storytelling to express potentially tragic and serious issues, such as a state’s disappearing water resources, is immense. I have researched map based stories, traditional fictions, films, wearables and interactive web experiences. I am inspired by wearable designs such as Kobikant’s “The Crying Dress”, Chiu Chih's “survival kit for the ever-changing planet”, and Diffus’s “Climate Dress.” All address the issue of climate change through speculative design. The Climate dress uses CO2, one of the principal causes of climate change and ozone erosion, to create visual patterns on a garment; this dress confronts us with our own environmental destruction in a beautiful display what creates a dark paradox. My exploration into objects telling stories led me to Daniel Spoerri's work. Spoerri would have a dinner party or event and then keep the plates and tables eaten off of in the form of a "snare-pictures," a type of assemblage or object art (Melanie Biehle 2014). The reason that I like this form is because of what it tells about the people who had these experiences. I am interested in understanding what story a user would make after viewing a collection of objects. Are there connotations about someone we can learn from seeing a collection of their possessions? 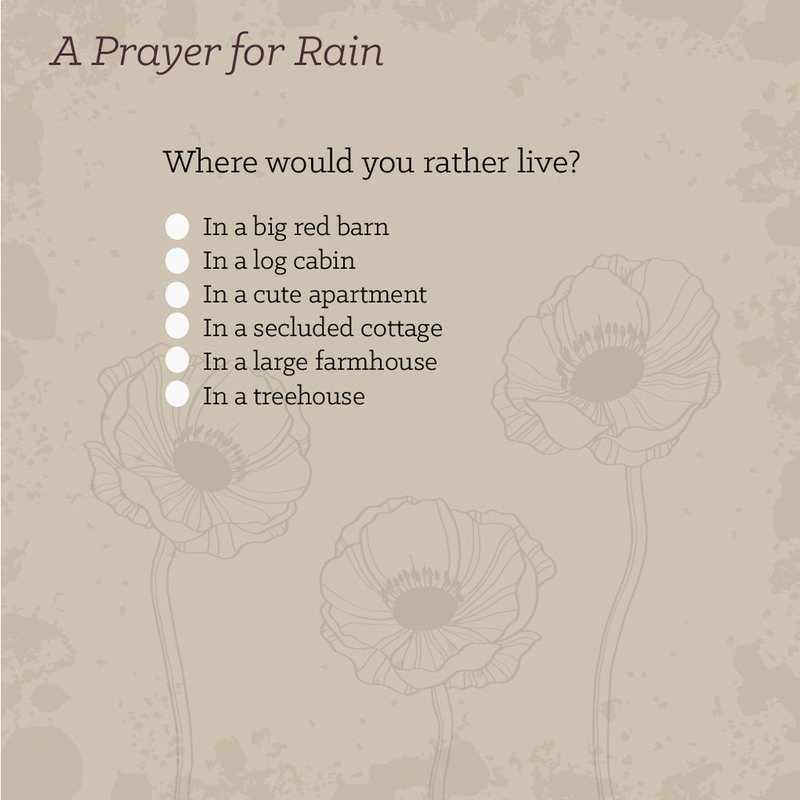 A Prayer for Rain is an experimental adaptation of the Russian Rusalka myth which leverages interactive objects and maps to explore the water crisis in Central California. The project is meant to inform the user about the damages of climate change and unregulated groundwater consumption within California, through the lens of a compelling, mysterious narrative. The piece will explore web based interactive media as well as three constructed, responsive objects as a means of storytelling. I am adapting the Rusalka myth of a fallen water bearer to be set in the current day Central Valley of California. The story follows the disappearance of a water witch, Antonia Rivera, from the town of Visalia. Her friends and family set out to find her, only to discover that she has drowned in the river. Some believe she has become a Rusalka because of the strange artifacts and evidence they find while looking for her. The user will search for her and uncover dark truths about what she has become and what has become of the environment and water that they depend on. Another component to the piece is a an interactive website and map. This component will combine fiction and fact about the area, including hyperlinks to real and fictional articles about the missing woman, climate change, and the California drought. Each user is assigned a character based on their answers to the quiz, and they explore the map from that point of view. The user will then interact with a map that allows them to explore the narrative and the sites specific to the fiction and the mysterious disappearance. Each character played will have a different experience of the story, with unique texts and interactions at the various locations on the map. The user will explore a collection of three interactive artifacts from Antonia’s personal belongings: a headpiece, a pendulum, and a fountain. The objects will help entrance the user into the mysterious and magical world of the Rusalka. They will be displayed in a museum installation style. For example, a user might interact with the pendulum and they will discover that the it is pulling them toward a fountain in the corner of the room that turns on when they come near. This kind of embodied experience of the environment and the objects from a character’s life may help tell another side of the story about Antonia’s disappearance and provide the user clues that will help them uncover the mystery. My first paper prototype combines paper engineering, soft circuits and a new idea. When thinking about my project I imagined the future in 50 years, when climate change has progressed to create temperature extremes and air pollution issues. I want to investigate the way in which we might adapt our clothing and fashion items to address these climate and environmental shifts. I imagine a fan that would turn on when you unfold it and sense the particulates in the air and change a series of LEDs to indicate the relative air quality near the user. As the air gets worse, the fan's pattern will become more beautiful, brighter, and vibrant. I imagine the fan will look amazing in the very polluted Central Valley of California and look very simple and plain in the clean sea air of Honolulu, Hawaii. Although this is not indicative of the form of my final prototype, this piece helped me understand how I might connect interaction to objects that mediate human temperature and comfort. I used the second prototype to explore narrative rather than concept. I created a workshop/user test for my second prototype. I gathered a series of objects and presented them to a group. Each person was given a pen and a notepad. They were asked to explore the objects on the table in front of them and then create a story about the person who they might have belonged to. They were also asked which of the objects told the story of the character most strongly and why. I presented these objects to two different sets of people for a total of 30 people in the user test. I discovered many similarities between the kind of character most people imagined after interacting with the collection of objects. Most people described this character who owned the objects as a woman in her late 20s to 30s. They described her as a traveler and an imaginative person who loves animals and music. They also had similarity across the objects which resonated with them to tell the story of the character. This prototype informed my understanding of how a character could be constructed out of the objects that they own. It helped me identify my main character and the world in which she lives, or wished she lived in. I pictured a woman from a hot and dry place, dreaming of water. That is exactly who I ended up creating for my project. My third prototype focused on building a narrative frame for the story I want to tell. I created a museum wall style story layout. I presented this to various critics and student groups in my thesis class and got feedback on the narrative. The images of the narrative handouts are pictured below. Primarily I used this prototype to inform my fourth prototype, a proof of concept, which will be the final one I make for the semester. By synthesising the lessons from all prototypes I made the choice to focus on creating a dynamic, interactive narrative as my primary task for the end of the semester. I am focusing on my strengths and creating a story with a game style branching narrative and then placing that story in the framework of a website and map. I will simultaneously work on creating the artifacts of Antonia’s life, but that is not the deliverable for the next prototype. Much of the feedback I received focused on people wanting a compelling (and finished) narrative. Now that I have that base story, I am focusing on how to best tell it. 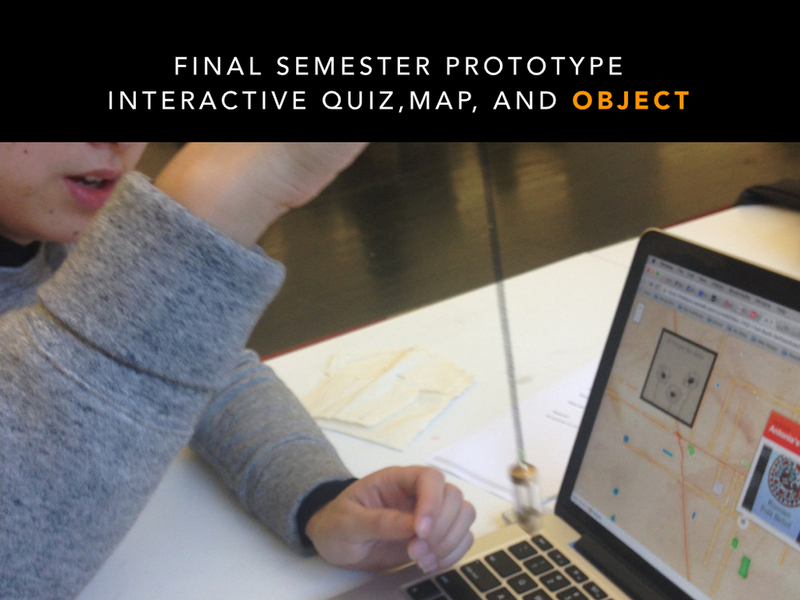 The final prototype consisted of a quiz, map, and object that users could interact with. They all helped guide the user into the world of the story. Bio: Six years younger than her sister Antonia, Maria possesses a sharp, literal mind, more comfortable with machines then spirits. She has taken to the sciences at her local high school, excelling as one of the top students in her class. Already she is dreaming of college in Los Angeles, where she would like to study both computer science and physics. Relationship to Antonia: The two sisters have a close but complicated relationship. Maria sees their hometown as a location to escape from, not invest in. She looks at their mother as a cautionary tales -- that hard work does not always equal prosperity. Meanwhile, Antonia’s insistence on dowsing, a job with no future and little pay, infuriates Maria, who wants her sister to find real work, like a teacher or nurse. She sees Antonia’s spirituality as a relic of their mother, a woman who in ten years will need both sisters to help look after her. Roleplaying Notes: Intelligent but traditional, Maria rarely sees the value in what cannot be explained. She has no time for fighting the system. Instead, she wants to put herself in the best possible place to succeed. If that means leaving home, then so be it. The world is a large place. Quote: There’s not much to do around here, you know? You’ve got to be careful, too. Lots of ways to get yourself trapped, mostly by boys. Maybe once I get to LA life will be easier. Bio: Born in Chihuahua, Mexico, Laura met her husband Marco Rivera when she was nineteen. They moved to America via Texas in 1988, right in time for Antonia to be born in El Paso. Originally intending to find live near Marco’s brother, the couple moved to California’s Central Valley in 1992 to find consistent work. In 1995 they became citizens. Their second daughter, Maria, was born in 1998. Marco died three years later in a farming accident. After a period of grief and convalescence, Laura dedicated herself fully to providing for her daughters. The last thirteen years have been a mixture of hard work and gifts from God, with Laura taking a steady job at the Visalia DMV and becoming more involved in the family’s church. Relationship to Antonia: Deep in her heart Laura is proud of her eldest daughter for her talents and dedication to their community. A tinge of fear, however, howevers over Laura in relation to Antonia’s role as a dowser. From the mother’s perspective such talents are only respectable with the help of God, a warning Antonia has often ignored. Now that her daughter is missing, Laura fears every kind of disaster that could have befallen Antonia -- from random violence to God’s sudden wrath. Roleplaying Notes: Despite her thirty years in the United States, Laura is still at heartl a Mexican girl of the pradera. She believes in the sanctity of family, the righteousness of God, and the holistic goodness of earth to provide for people. While often overwhelmed by the lingo and assimilation of her American children, Laura is in fact quick of mind and steady of nerves. Her reserve of strength appears in moments of great challenge, where her faith in God and love of her daughters powers her to feats of stunning courage. Quote: We are fortunate to have God with us in our hearts. He is with us, right here, and He will not let us down when we need Him most. Relationship to Antonia: Mark met Antonia three years ago through a mutual friend. It took him four months to gather the courage to ask her out, a decision he still considers “one of my best.” While their relationship has had its ups and downs, he has always been loyal to his first real love and still holds out hope of marrying her, an offer she has politely turned down on two separate occasions. He knows most of her friends, has met her family dozens of times, and believes in the work that she does. His love for her is quiet, with a kind of reverence that he suspects Antonia actually dislikes. He can’t help it; he knows a perfect person when he sees one. Roleplaying Notes: Large but gentle, Mark is slow to speak. He carries a deep sadness about Antonia’s disappearance, a depression his friends and family have begun to notice. Mark is often unconsciously spiritual, observing omens with the kind of solemn assurance that one usually reads in a street sign. Quote: Sometimes I stare at the sun as it falls down the horizon. There’s nothing in this world that can be really known by any of us. Sometimes that gives me hope. Sometimes that makes me afraid. Relationship to Antonia: Father Torrez knows Antonia mainly through her mother, Laura, who comes to church every Sunday. Torrez’s own dealings with Antonia have been more scarce, as the young woman has gradually stopped attending services. Still, he has always seen Antonia as a bright and intelligent young woman with the goodness of God in her heart. Though she has sought his counsel only once, he find her dedication to the land and its people of Visalia admirable. He hopes she will come to speak to him more often. Roleplaying Notes: Father Torrez is well aware of the difficulties facing the members of his parish. His training has helped make him a steady presence in their lives, a pillar he hopes his flock feels comfortable leaning against. While a trained man of God, Father Torrez prefers to answer the mysteries surrounding him by the common logic of what he finds in front of him, whether that is the open farmlands of Visalia, the law that governs it, or the men and women who depend on him. Quote: There are good people here. The problems that this community faces, poverty, crime, and now this drought, would test anyone. I pray each night for God to grant all of them the wisdom they need -- and some wisdom for myself as well. Bio: Originally from Seaside, California, Nancy Brooks moved to Visalia twenty years ago when her husband when he got a job with the local water utility company as an engineer. Since then she’s opened her own shop dedicated to harmony and spiritual fulfillment, subjects she feels passionately need championing in this day and age. Though now divorced for the last five years, Nancy can’t imagine moving anywhere else. Visalia has become her home and while not all the people understand her store or her work, enough do to keep her happy day by day. Relationship to Antonia: Nancy originally met Antonia when the young woman came in looking for crystals to assist her at dowsing. They became friends, with Nancy loaning her several books on everything from elemental magic to astrology to psychic phenomenon. Over the past two years Nancy has seen Antonia go from a unsure practitioner to one of the more confident and successful dowsers in the Valley. Childless herself, Nancy can hardly help but think Nancy as a long lost daughter… a person sent by fate to warm her life. Information Known: Nancy probably knows more about Antonia than any other single character…. Roleplaying Notes: To Nancy Brooks, the world is a beautiful place if you just look at it long enough. All terrible things can be defeated if confronted with a calm attitude and awareness. Her time in Visalia has taught her that all people want to do good but they don’t always know what that is. Her job for the past twenty years has been to teach and assist, to help those who have the courage to ask on their own path towards spiritual unity. Quote: Well, if the Universe wants you to have that, it’ll be there when you come around. No need to whine and worry and choke. Here -- have a cookie. Bio: Robert Garcia was born and raised in Visalia, not ten miles from where his farm stands today. He never married, never found the time, and instead has poured his life into the patch of land he was able to buy, at first on credit, then later adjacent parcels in cash. Robert is known throughout the town as a good farmer and decent man, albeit a little strange while drunk. Though he has no children of his own, Robert hopes to leave his land to his nephews, good boys who live two towns over and work in autobody garages. Relationship to Antonia: Robert hired Antonia two months ago to come onto his land and help him find where to sink his well. From his perspective she did good work and he’s been able to water his crops steadily so far. He believes in her ability, as his mother had been a water witch herself back when he was a boy. Apart from their professional relationship, Robert enjoyed Antonia as a person. She seemed honest and lovely, a true blessing on parched lands. Roleplaying Notes: Troubled and observant, Robert Garcia worries about the town he grew up in. Though outwardly confident in his ability to weather the drought that has taken the land, secretly he questions whether the way of life so constant in this corner of California is coming to an end. He can’t picture himself somewhere else, doesn’t even want to contemplate it. He’ll live and die on his land, come storm-water or dust. Quote: So much that’s going on isn’t right, you know? Kids today ain’t got no future, the colleges won’t help ‘em get jobs. They know it, too; that’s why they don’t work like we did twenty years ago. It’s a damn shame. after his wife died to raise his three girls in a quiet town full of open skies and simple people. Though all of his daughters have gone off to college, Ray continues to serve as Visalia’s sheriff, a job he expects to do for as long as the town will elect him. Relationship to Antonia: Ray Williams has known Antonia since she was a little girl by way of her father, Marcos, who struck up a friendship with Ray early in his family’s time in town. Antonia’s never been in any kind of trouble so Ray has had no need to keep his eyes on her. From his perspective she’s a bright girl interested in helping her community. He sometimes worries about her, her and Maria, and how hard it is for them to move on, go to college, like his own three girls did. Roleplaying Notes: Since Marcos’ death Ray has tried to assist the Riveras as much as he could over the years. He has particular sympathy for Laura, raising two girls alone just as he did fifteen years before. Though he’s served as sheriff for almost fifteen years, Ray doesn’t lose much sleep over what he’s seen or what might happen. The law can handle all comers as long as the men and women who wield it are prepared in their minds and steady with their hands. Quotes: You keep your eyes open around here and you’ll learn a lot. This town has everything you need, history, beauty. It’s places like this that are going to see America through this difficult patch she’s in. Simple people. Honest work. That’s how all of this was built. Robert Garcia greets you with a warm smile. He says, “How you holding up, Chica? I’m so sorry your sister is missing. Do you think she could have set out in search of some underground river? It seems like yesterday that she was out here helping me find my latest well. It seems like the river’s drying up and even the underground water is slow going. Here is the map she made me on the water source. I can’t make out what all of it means, but maybe it can help you find her. “Hi Maria, long time no see,” says Nancy Brooks. I last saw you when you were, what fourteen? Your sister was helping around the store. I am sick to death that she is gone. I can’t help wondering if it has something to do with this book I gave her recently. I feel like this could be all my fault… “What book is that?” You ask tentatively. This book on Russian Mythology. The books talks quite a bit about water witches of old. I think Antonia was taken with the story of the Rusalka, particularly. Maybe if you go to her house you can find it? Perhaps it has a clue about where she might have gone. You open the door to Antonia’s house with your spare key that you keep in case she locks herself out. The place seems out of sorts. Although you know your sister is not the cleanest person, the house has a strange smell of a bitter herb and you hear something coming from the bathroom. As you walk toward the bathroom you realize that the tap is running and a flickering light catches your eye. Hung above the shower is a small brass pendulum, swinging. It seems to be responding to the water. You turn the taps off and the pendulum stills. Below are some of the objects I am collection. 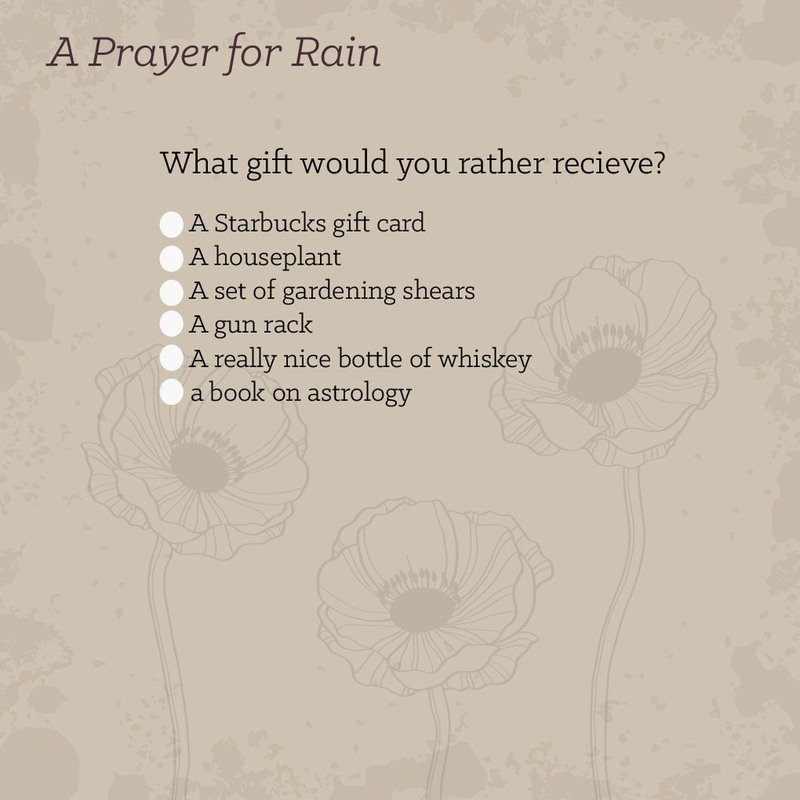 I conducted five user tests for my thesis project, A Prayer for Rain. The tests focused on my fourth prototype, which is a proof of concept interactive website. The website design was created in InVision and CartoDB. The tests were used to assess the clarity of the narrative, the usability of the website, and the accessibility of the website as a platform for storytelling. 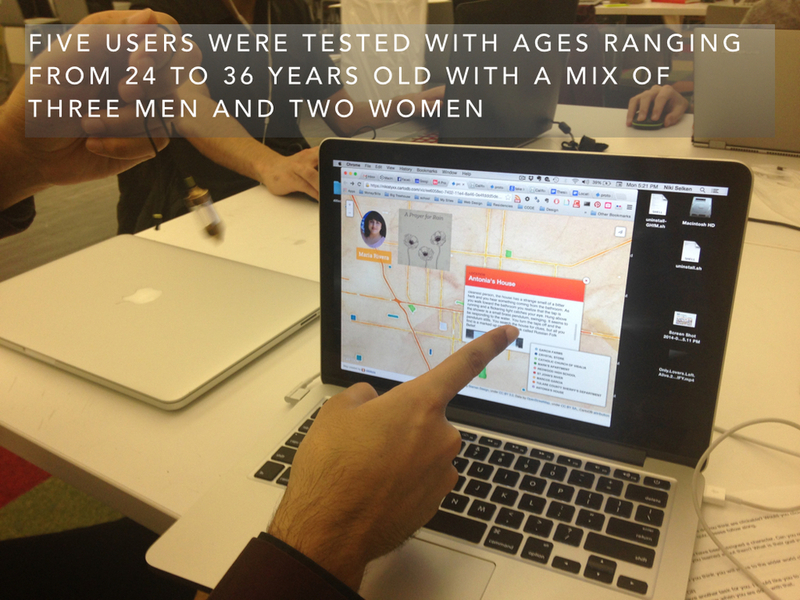 I tested five users between the ages of 24-36 with a mix of three men and two women. The most important finding from the user tests was that most people did not connect the drought in to the story I was telling. That seemed to be due to a mix of poor interface design choices and lack of direct tie in to the conditions in California. My next steps will be to visit Visalia, CA in December to do fact finding, video recording, image collection as well as interviewing locals about this issue. I hope that this process will spark a connection for my narrative to the climate change issue and allow me to bring it to the forefront of the story. I will also make modifications to the design to improve readability and understanding of hot-spots and links within the hypertex. 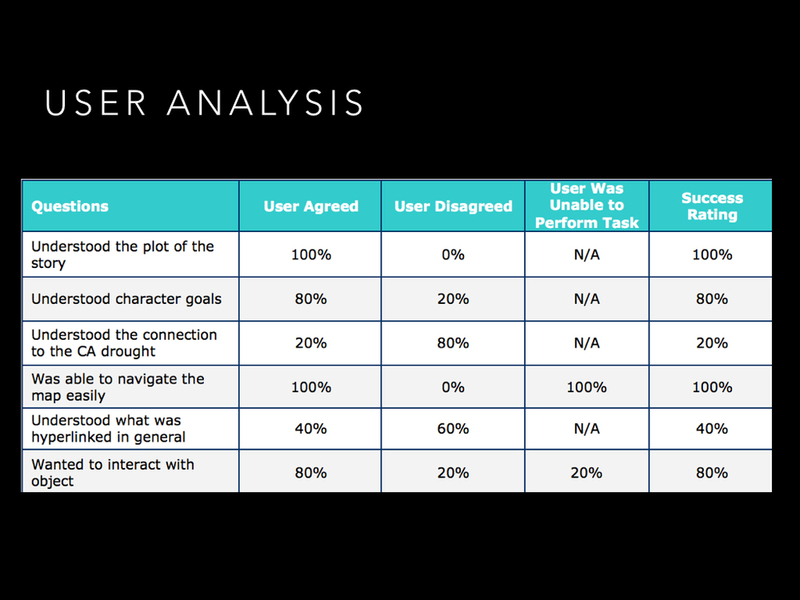 The most positive element of the tests was that the users could understand the narrative and enjoyed the connection between the map and the object to tell the story. So that the form of storytelling I am leveraging is entertaining and engaging. I have collected various copper and brass environmental instruments, which I plan to make interactive by leveraging their conductivity and Arduino code and sensor technology. I envision that these objects will help tell the story of Antonia’s life as artifacts of her work and passion, finding water in the earth. I will have completed one interactive object by the end of the semester and complete the other two during the following semester. I have already created the characters, setting, and plot structure. I will have a completed prototype and user test of one of the three main “playable” character maps in CartoDB by the end of the semester. I will work on developing the two other character journeys throughout the first half of next semester. I will develop much of the visual content during the week of December 15th, when I will visit Visalia, CA the setting for the story. I will take photos and videos of the area to use in the interactive map. Week of November 24th: Conduct user tests of the website prototype and interactive map. Week of December 15th: Visit Visalia and take photos and video of the area for project website. Let this inform the story development. Week of January 5th: Finalize the story based on finding in Visalia and begin redesign design for the interactive website/narrative. Week of January 19th: Finalize the design for the interactive map and begin to build interactive artifacts. Week of February 2nd: User Test the Interactive map and Website prototype. Week of February 16th: Finalize Revisions to the Map and Website. Week of March 2nd: FInalize design for at least three artifacts. Week of March 16th: Complete the production of the three artifacts. Week of March 30th: User test the three artifacts alongside the interactive web components. Week of April 6th: Final presentation to determine entry into the show. Week of April 13th: Perform any revisions to the final pieces based on user feedback and requirements of the installation or thesis show. Week of April 27th: Document all designs and make sure they are on my website and on the thesis show website. Week of May 11th: Make sure all projects, documentation and research is prepared for the Symposium as well as installation. Ballard, J. G. Drowned World. Doubleday, 1962. "Chiu Chih's Survival Kit for the Ever-changing Planet - Designboom | Architecture & Design Magazine." Designboom Architecture Design Magazine Chiu Chihs Survival Kit for the Everchanging Planet Comments. Accessed September 17, 2014. http://www.designboom.com/art/chiu-chihs-survival-kit-for-the-ever-changing-planet/. "Climate Dress by Diffus." Ecouterre Climate Dress by Diffus Comments. Accessed September 17, 2014. http://www.ecouterre.com/led-equipped-climate-dress-monitors-carbon-dioxide-in-the-air/pollution-dress-6/. "The Crying Dress." KOBAKANT. Accessed September 17, 2014. http://www.kobakant.at/?p=222. "Five Myths about California's Drought." Washington Post. Accessed November 16, 2014. http://www.washingtonpost.com/opinions/five-myths-about-californias-drought/2014/08/29/6a6b8ed4-2c69-11e4-994d-202962a9150c_story.html. Martinez, Michael. "California Drought Victims Drink in Grandmother's Kindness." CNN. January 01, 1970. Accessed December 02, 2014. http://www.cnn.com/2014/10/11/us/california-drought-homes-without-running-water/. "My 417-mile Trip down the 'endangered' River." CNN. Accessed November 16, 2014. http://www.cnn.com/interactive/2014/09/opinion/endangered-river-ctl/. "Regional Climate Trends and Scenarios for the U.S. National Climate Assessment. Part 5. Climate of the Southwest U.S." Home. Accessed September 17, 2014. http://scenarios.globalchange.gov/report/regional-climate-trends-and-scenarios-us-national-climate-assessment-part-5-climate-southwest. Simonov, Pyotr. Essential Russian Mythology. London: Thorsons, 1997. Visser, Nick. "California Farmers Hire 'Water Witches' To Find Water As Drought Persists." The Huffington Post. TheHuffingtonPost.com, 02 Mar. 2014. Web. 16 Nov. 2014.